Here at Who What Wear UK, we're all about delivering the latest and greatest shopping edits, as approved by our team. That's why Team WWW UK has created this offshoot shopping column as part of our We Try Before You Buy franchise, in which I, Joy Montgomery, will be heading to all your favourite stores to test out new-in pieces IRL. 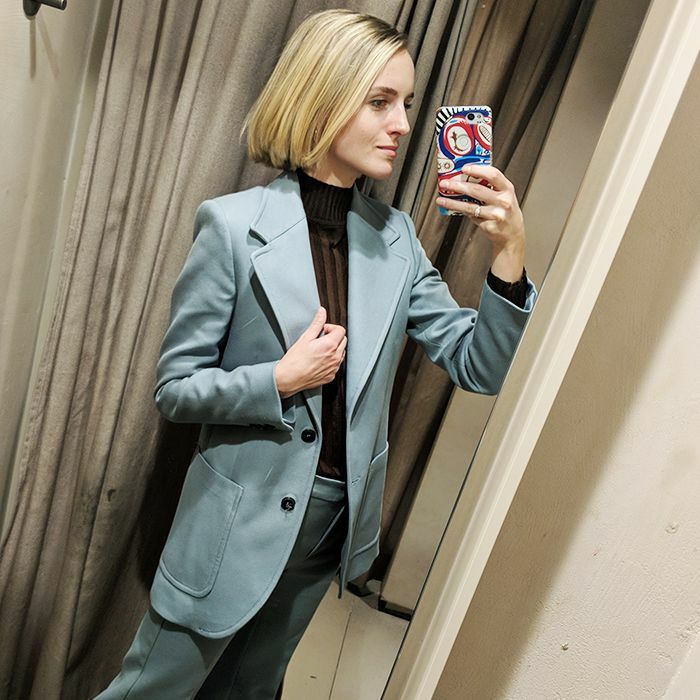 From summer dresses to intriguing brands, prepare for changing room selfies aplenty. Is there something you'd like me to cover? Make sure to tweet or message me via Instagram for requests. 'Tis the season to trudge around the high street and try on shimmering, spangled dresses. Yes, that's right—party season is almost upon us. Christmas might seem a long way away (60 days, if you're counting), but with office parties getting in there early, suddenly that big dress decision is looking a little close for comfort. I apologise if I sound a little "Scrooge" about the whole thing, but as much as I love the high street, party dressing tends to be a department that's never quite as modern as the other lines on offer. An overwhelming number of dresses seem to feature either a skintight fit, enough glitz to bedeck a Christmas tree, a bum-grazing hemline or all of the above. (Help.) While I have nothing against other people going to town on the above, I personally find these pieces can feel at odds with my normal style. If you're like me and don't have the funds to invest in a Vampire's Wife frock (a girl can dream), the high street will just have to do. So I made it my mission to find those affordable, party-ready gems that'll make you feel a million dollars—even if they only cost £50. It wasn't easy, but after three hours of shopping, I managed to rustle up 15 looks I would happily hit the dance floor in. On my travels, it became clear that '80s and '90s party dresses are having a moment, as there were plenty of big shoulders, statement fabrics and sultry slip dress styles. My top picks would have to be H&M's gorgeous pleated leopard midi, Topshop's polka-dot mini and & Other Stories' velvet wrap dress. These picks are grown-up and on-trend yet still glam. I'm sold. Scroll down to see and shop the high-street party dresses that I fell in love with. Style Notes: As someone who usually shies away from print, I was surprised by how much I loved this H&M dress. It felt so high-end with its silky fabric, luxuriously pleated skirt and statement cuffs. If you're like me and are lacking in the chest area, you might want to go a size down. Style Notes: This tasselled number from Zara felt very noughties with its simple silhouette (which is needed when you have such a statement fabric). The dress also had a stretchy fit, which made it super comfortable to wear; however, it still looks polished when worn with heels. Style Notes: This Topshop piece is the perfect antidote to all the sequinned, body-con styles around at the moment. 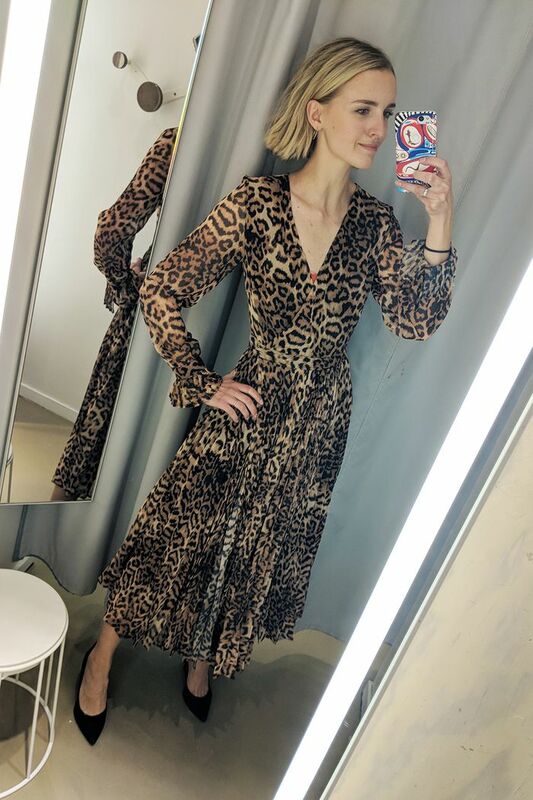 I felt very Olsen twins in this knotted midi dress, and I think it's perfect if you're looking for a more "fashiony" party look. Style with statement earrings and a simple box clutch. Style Notes: There are plenty of slinky slip dresses making the rounds on the high street, however, I imagine there are some who don't feel comfortable with the barely-there aesthetic. Layering a sequinned top underneath is a great way to add both style and substance to a strappy dress, and this Zara look does the job nicely. Style Notes: This polka-dot piece was one of my favourites from the whole trip. While it might be shorter than I'm used to, I instantly fell in love with the long sleeves, '80s-inspired statement shoulders and ruched satin fabric. Personally, I would style with tights to make the plunging neckline more of a feature. Style Notes: This green midi is for all you party dress classicists out there. In a universally flattering shade of green, this & Other Stories look is great for those wanting a more covered-up look without compromising style. Style Notes: It would be blasphemy to go on a party dress shopping trip without trying on a slip dress because those babies are everywhere at the moment. This Zara iteration features ruched detailing (a little more forgiving than a bias cut), a cowl-neck and skinny straps. Prepare to party like it's 1995. Style Notes: Topshop hurtles back in time with this leopard-print silver '80s showstopper (not a good decade for minimalists). It came with an oversized bow, which I removed because it felt statement-y enough by itself. Thankfully, the voluminous fit is kept in check by a waist-tie belt. Style Notes: This is bordering on uncomfortable territory for me (body-con and diamanté straps—who am I?! ), however, in the world of sequinned dresses, I thought it was quite elegant thanks to its longer length and cool tasselled hemline. The piece I'm wearing isn't currently available online, but below is a similar look. Style Notes: In case you already don't know, wearing brightly coloured underwear when trying on party dresses isn't a good idea. This snakeskin look from & Other Stories comes in a lightweight, sheer fabric, making it so comfortable to wear. I like the balance of longer length and sleeves alongside the more extroverted print. Style Notes: This was an unexpected winner from the trip. As is often the case with & Other Stories, this dress didn't look inspiring on the hanger, however, I loved it on. The unusual colour makes it feel quite high-end, and suprisingly, I enjoyed the built-in shoulder pads which are subtle and help to balance out the silhouette. It's a 10/10 from me. Style Notes: This dress might not be to everyone's taste, but I liked the fact that it felt a bit different from most of the other party pieces on the high street. The velvet fabric, high collar and gold embroidery make it feel like a vintage piece, which is never a bad thing. Style Notes: If you're looking for something that will take you from desk to drinks, try a shirtdress in a bold colour or print. This Zara snakeskin dress will look just as good with flats as it will with heels. For extra trend points, style with a chain-link belt. Style Notes: Hot pink might feel a little Barbie, but add floaty sleeves and '80s-inspired velvet fabric, and suddenly we're in trend territory. That being said, I did have to shift the diamanté heart buckle to the back to keep from being too tweeny. Style Notes: This dress couldn't be more '90s if it tried. It features a cowl neck, skinny straps, animal print and slinky silhouette. Weirdly, I think the stretchier fabric might be easier to pull off than some of the bias-cut alternatives, which can sometimes cling in odd places. I would accessorise this with a beaded bag and hoop earrings. The piece I'm wearing isn't currently available online, but below is a similar look.